HoRNet ELM 128 is a metering plugin that complies with the EBU R128 standard. The plugin provides five different loudness measurement: momentary, short-term, integrated, dynamic range and true peak. 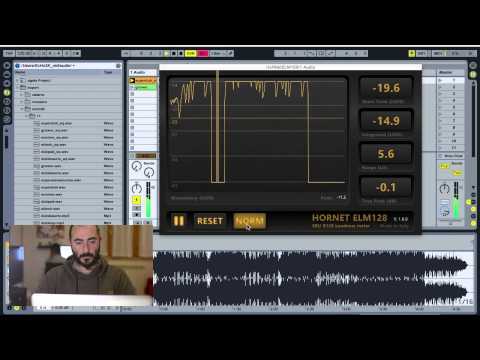 This new kind of loudness metering comes from broadcasting and aims to reduce the difference in the perceived levels of different programs, to help with this task HoRNet ELM also provide a normalization function that adjusts the gain in realtime so that no signal exceeds the reference set by you. This meter uses LUFS as measurement units (Loudness Units Full Scale) a LUFS is equivalent to a dB but the difference come from the pre emphasis filter used before any loudness calculation, this filter compensates the non linearities of the human hear do that any measurement takes into account ho we human perceive sounds. True Peak: this meter shows the maximum level of the signal in dBFS using a 4x oversampling (below 192KHz sampling frequency) to faithfully represent the inter-sample peaks. We don’t provide a demo for ELM128, but we offer a 100% money back guarantee if you don’t like it! great product used it as soon as i got it for a tv commercial a client wanted mastered ..great price too .. thanks! Excelent plugin and works like a charm in PRO TOOLS 10 !! I use it a lot of times but I miss the posibility to "RENDER" to a NEW FILE (or sound clip) the analysed track, in order to have 2 FILES (original and rendered at EBU-R128) as in AUDIO SUITE. IS THERE A WAY TO DO THAT IN PRO TOOLS? ?